The Lady Anne Lytton Trophy for 2014 will be awarded to the leading sire of the year and presented at the National Championship Show in 2015. The leading sire of the year will be the stallion siring the greatest number of progeny to win a first prize at any of the listed shows. Owners of stallions registered in the UK, alive and available to the public for breeding during the year of competition are invited to enter. 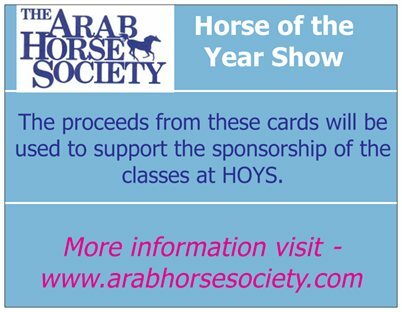 Anyone wishing to have their stallion considered for the Lady Anne Lytton Trophy should obtain an entry form and rules from the Arab Horse Society office. 1. Stallions must be alive and available to the public for breeding during the year of competition. 2. 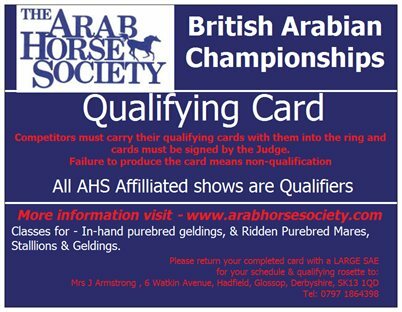 Qualifying shows must be affiliated to the Arab Horse Society and shown in the list below. 3. The scores of pure bred progeny from conventional In Hand and Ridden classes to count. 5. First placed horses score one point. In the event of a tie second placed horses will be considered. 6. A prizewinning horse can only contribute one point to its sire's score even if it wins several classes in a calendar year. 7. The competition runs throughout a calendar year. 8. The results will be announced at the AGM and the trophy awarded at the National Show. In some cases this may be varied. The trophy will not necessarily be retained for a full year and must be returned before the AGM each year. 9. The owner of the winning stallion is wholly responsible for any promotional activity in respect of the award. 10. Entries must be received at the AHS office by 31 January in the year following the year of competition. 11. Nominations will only be accepted from the registered owner of the stallion. Only eligible if affiliated to the AHS in the year of competition. Classic Head, Pairs, Members, Racing, Liberty, Amateur, Young Handler/Rider, etc.